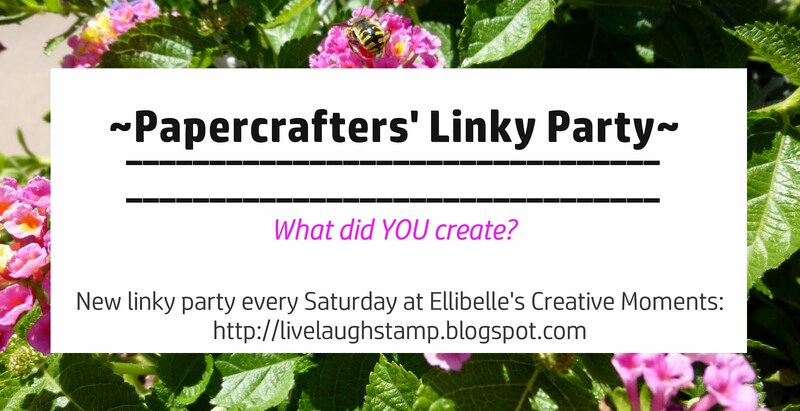 Hi everyone and welcome to the Whimsy Prints BLOG HOP! 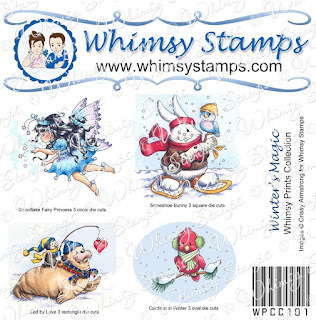 In October, Whimsy Stamps announced the release of a BRAND NEW Whimsy Stamps product line - the Whimsy Prints Collection. The Whimsy Prints Collection are beautiful sets of hand-colored images which have been digitally reproduced and die-cut into various shapes. Whimsy Prints are printed on 100lb premium coated paper and professionally die-cut leaving smooth edges. Each pack contains 12 die-cut prints (3 sets of 4 images). 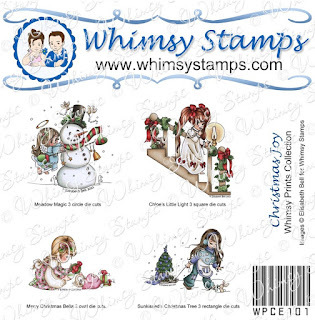 Whimsy Prints Collection are very straight forward and easy to use. 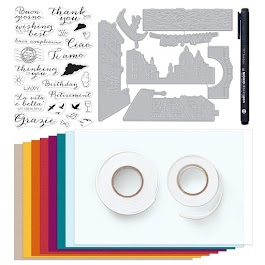 They can be attached directly to your project with glue or double sided tape. Use them as is or cut to fit the needs of your project. One of the benefits of using Whimsy Prints is to cut back on the amount of time needed to hand color images. To summarize, it is a great way to make quick projects when time is of the essence! These are also wonderful for beginner crafters and kid projects. If you joined us for our last 2 releases, you may have seen some of the beautiful projects our DT and Special Guests have created using these prints. 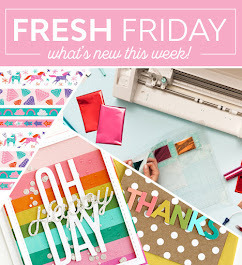 Today we are showcasing these gorgeous Whimsy Prints with a special BLOG HOP! In addition to our regular Special Guests, we are delighted to welcome both Crissy Armstrong and Elisabeth Bell who are joining us for this hop! The hop starts today (Friday November 30th at 12.00PM EST) and ends on Monday December 3rd at 12.00PM EST. For this hop we have 4 different candy stops where you can enter to win a set of Whimsy Prints. The location of these candy stops is a secret, so if you haven't found them, please go back to the beginning and start hopping! If you would like to hop along with us today and haven’t arrived from Jacque Beddingfield's beautiful blog, please CLICK HERE to return to the beginning of the hop at Bev's blog. I decided to make two projects for today's blog hop. Below is a quick and easy to recreate christmas card, perfect for those last minute cards that still need to be made. For the above card I used one of the pre-colored prints (toppers) from Whimsy's "Winter Magic" collection by Crissy Armstrong. I simply cut out my designer paper (by Stampin up -retired), added my Whimsy Prints image which I layered onto a scallop oval nestabilies shape. Then I added a strip of real red card stock to the right and a narrow strip of red and white to the top. Thought a snowflake diecut would look nice so I used my Whimsy Stamps snowflake border die to create one. To finish it off I added a button and some twine, and sewed around the edges before layering it onto real red card stock. 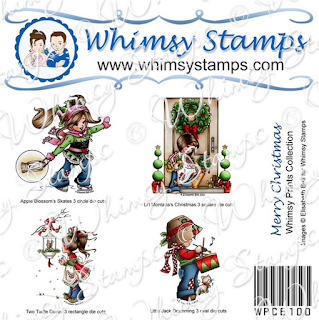 The sentiment is from the Whimsy Stamp set "Christmas Stocking sentiments". Here is my second creation. I just love this gorgeous snow fairy image, also by Crissy Armstrong. This one is also from the precolored prints set "Winter's Magic". And I just love the way Crissy colored this gorgeous fairy. My daughter is going to be in the Nutcracker ballet performance and one of her parts is a snow fairy. I thought she would love this wall hanging for her room. 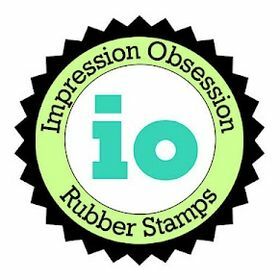 This was really easy to create too, it would make some really fun last minute gifts, and if you have an alphabet stamp set, it's super easy to personalize too. My paper is from the paper studio I believe. I layered the precolored print onto a square night of navy piece of card stock, then layered that onto brushed silver card stock. Sewed the edges and adhered it onto the designer paper. The letters were stamped from the Whimsy stamp set "Spell it out", cut them out and then arranged them onto the bottom part of the picture. I added a few punched out snowflakes and some rhinestones, and then a little bit of ribbon and silver twine. This was then adhered onto some white heavy weight paper which I scored twice to create a sort of a "border" Layered again onto night of navy. I have found a silver square picture frame for this at the goodwill store, but when I took a photo of it in the frame it was reflecting everything, so I am posting the photo without that frame. So now it’s time for you to continue the hop by hopping over to Simonne Clay's beautiful blog. Thank you so much for hopping with us today and I hope you enjoy our Whimsy Prints projects! 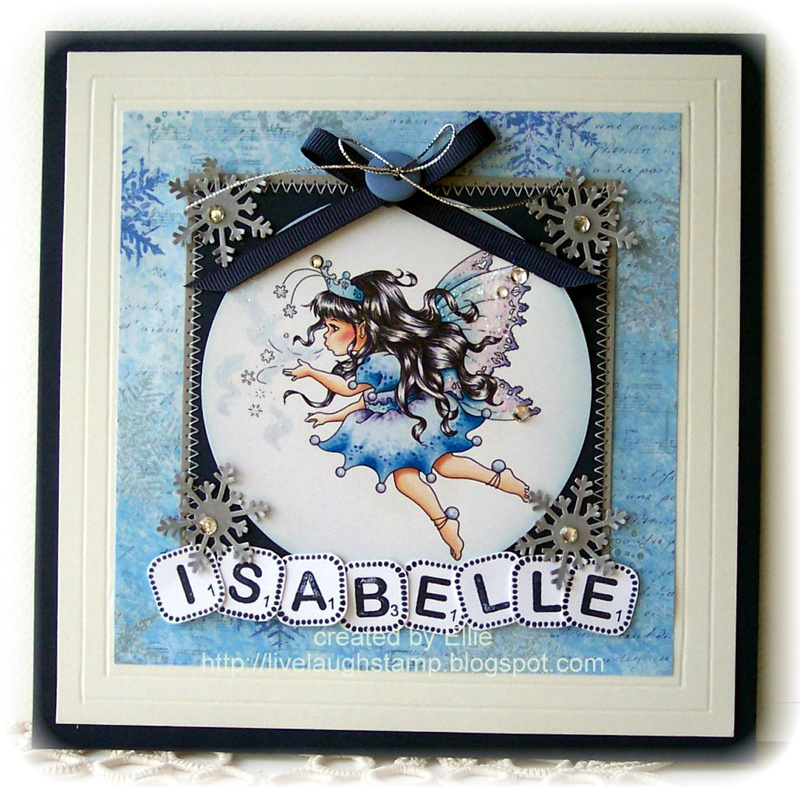 Two gorgeous cards - really love the blue one with the cute little fairy. Just so beautiful - I love them! Lovely card and wall hanging, Ellie!!! Love the way you spelled out Isabelle's name...soooo cute!!! Aren't these PRINTS fun?? Love them!! Have a beautiful weekend...Big hugs!! 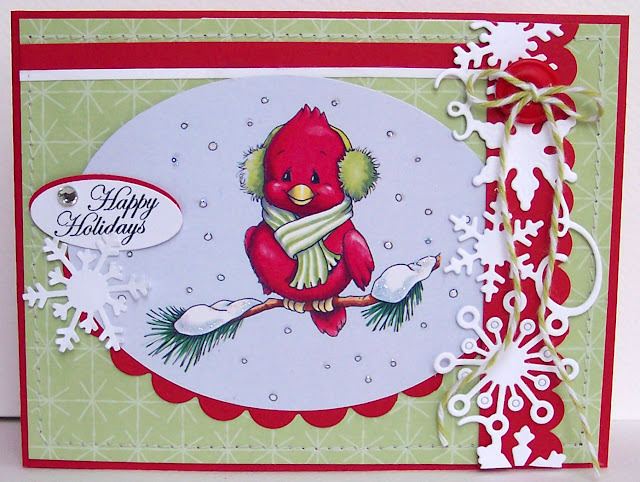 Your card is so lovely - and these images are wonderful and adorable. The wall hanging for your daughter is beautiful. I am such a fan of blue shades! Thank you kindly for sharing! Gorgeous cards, Ellie! 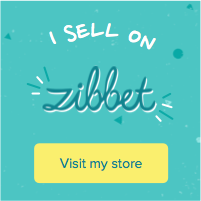 I love your designs with the beautiful prints! wow, ellie, these are both beautiful! that little birdie is tempting and you made a gorgeous keepsake for your daughter! Love these cards. Guess I'll have to look into getting some of the prints. What a good idea for quick cards! Your projects are so cute. FABULOUS Ellie!!! I am just lovin' these prints!!!! Both projects are so beautiful and I agree soo easy to make it seems. Will have to try these. Great designs. Love the snowbird!